Progressive rock is a genre of music that I have liked, if not preferred, over the years. It was intended to move beyond the standard verse-chorus form of rock music and achieve a higher level of artistic credibility. Musically, it often worked. Gifted musicians were allowed to work in classical and jazz elements while extending the music beyond the 3-4 minutes allowed on radio, while not yielding to unfocused jamming meanderings. The music was intelligently considered and very much structured by the needs for each song. Groups that were successful musically include (early) Genesis, King Crimson, Renaissance, Yes, and to some extent, Pink Floyd and the Moody Blues. While attempting to elevate the art form, they also invited significant derision by tendencies to take themselves too seriously with abstract or fanciful lyrics and a self-important delivery that undermined their mines. Emerson, Lake & Palmer, anyone? Genesis is a fine example of that. Many of their early albums include beautiful guitar and keyboard parts, generally accompanied by keen transitions from one section of a song to another. At the same time, their lyrics were void of emotions yet played as if they were grand drama. Their original guitarist, Anthony Phillips, helped set the musical foundations of the band, but, in 1969, was too tender an age and stage fright necessitated that he leave the group. He continues a a solo artist today with regular releases virtually unheard except by a cult following. These are primarily unaccompanied 12 string guitar and piano pieces that might be considered tasteful elevator music regardless of technical proficiency. In the transition from where he was to where he is were two distinctive and worthwhile albums. His debut, "The Geese and the Ghost," was an instrumental progressive piece with folk and baroque influences, and was well received for what it was. In 1978, he released his second album, "Wise After the Event," which is record company demanded to include vocals. Phillips was regarded well enough at the time to warrant a "picture album," where the cover art was printed onto the vinyl. Thirty years later, and in tandem with the 40th anniversary of the beginning of Genesis, this album was remastered and re-released, with a 2nd CD of primarily instrumental demo versions. than anything released by his original band, which by comparison sounds dated compared with this timeless work. Phillips chordal electric twelve string, piano, and solos drive the music where it needs to go, and the accompanying musicians keep it interesting by contributing what is needed for each piece, rather than attempting to draw attention, or, contrarily, just provide the expected. With additions of sax, flute, oboe and harp, there's variety and much to be appreciated in the music. As Luther strode up, crying "Winter Rules". "you're out of bounds I'm really quite convinced". Added to the mix is one of the best album covers ever, as Robert Cross used the lyrics from the songs to construct fanciful, intricate, and humorous cover art - with squirrels, astronauts, bears, golf balls, seals, and others placed (and often hidden) in a "Moonscape," also a title of one of the songs. The original album had only one disc, but it opened allowing for fairly expansive artwork within, as well. As Phillips and others remark in the included commentary on the CD, the vocals were the biggest challenge. Phillips has what at best might be described an average voice, and his lack of confidence was a battle through the recording. While his label's insistence that he sing is curious, what results is a charming tone over a very sophisticated musical work . And that's a rarity for progressive rock. The bonus disk (which is often understood to include junk that is no bonus at all), can fairly be viewed as an instrumental version of the album, without some of the overdubs. This is quite enjoyable as well, and, no doubt, is a gesture towards his fans who favor his instrumental talents. 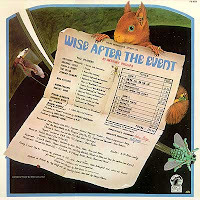 The CD remastering is exceptional, and "Wise After the Event" is highly recommended for fans of the genre or even with a curious ear. Suggested Tracks: All of them together; they work as a whole. 5 Stars (some credit given for the cover art).